UEP’s PI Andy Miles introduces the interim report for the Aberdeen Case Study. This report focuses on UEP research in the Aberdeen Case Study up until June 2015. The ‘urban village’ of Peterculter (known locally as Culter), is a semi-rural community with a strong industrial heritage and a rich associational culture situated on the south-western edge of the City. Positioned at the end of Aberdeen’s oil wealth corridor, Culter is a community in transition, serving increasingly as a dormitory town for the oil and gas industry. Yet it retains many of the ‘structures of feeling’ associated with its past and these are intricately bound up with its clubs, venues and physical spaces. 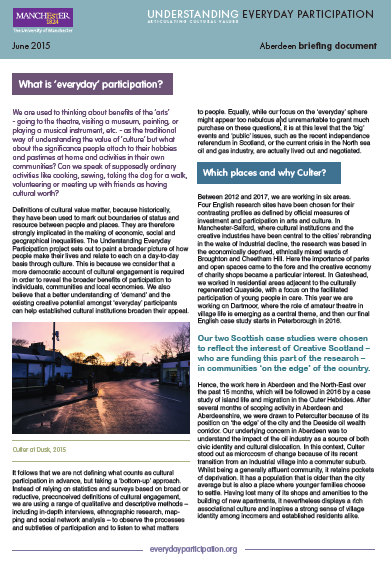 After this report was written, alongside the completion of our ethnographic and in-depth interview work, we also made a film about everyday cultural participation in Culter, which will be on general release via the UEP project website soon. This in turn led on to the co-produced Postcards for Culter project. Since completing our planned case study work in Culter at the end of 2015, Aberdeen has been badly affected by the global fall in the price of oil. We are hoping to return to the City soon to carry out more research with residents and policymakers into the impact of industry volatility and economic downturn on community participation and cohesion there. This entry was posted in UEP Report by Andrew Miles. Bookmark the permalink.